Beekeeping Supplies & Equipment - Just What You Need! Hive Stand - This is a platform to keep the hive off the ground. It improves circulation, reduces dampness in the hive, and helps keep ants, bugs, leaves, and debris from getting into the hive. It can be made of anything solid enough to support the weight of a full beehive. Wooden hive stands are available for sale but bricks, concrete blocks, pallets, and found lumber are just as good. It’s helpful to place the legs of the stand in cans filled with used motor oil to deter ants from climbing up the legs and into the hive. The stand should be strong enough to support one hive or a number of colonies. What is important to remember is that the hive needs to be at least 6 inches off the ground. Bottom Board - Is placed on top of the hive stand and is the floor of the hive. Bees use it as a landing board and a place to take off from. Entrance Reducer - Is basically a stick of wood used to reduce the size of the entrance to the hive. It helps deter robbing. Hive Boxes/Supers - Come in three sizes: deep, medium and shallow. Traditionally, 2 deep boxes have been used as brood chambers with 3 or 4 or more boxes (medium or shallow) on top as needed for honey storage. Many beekeepers use all medium boxes throughout the hive. This helps reduce the weight of each box for lifting. If you have back problems or are concerned about heavy lifting, you could even use shallow boxes all throughout the hive. So, 6 boxes as a minimum for deep and medium. More if you wanted to use only shallow boxes. You will only need two boxes to start out, adding boxes as needed for extra room and honey storage. Frames and Foundation - For each box you have for your hive, you will need 10 frames that fit that box. Frames can be wooden with beeswax foundation or all plastic with a light coating of beeswax. The bees don't care and will use both equally well. Foundation is intended to give the bees a head start on their comb building and helps minimize cross comb building that makes it difficult to remove and inspect. You can buy all beeswax foundation or plastic foundation with a thin coat of beeswax applied to it. Alternatively, you can provide empty frames and let the bees build their comb from scratch but that can be a bit tricky and it takes the bees longer to get established. Top Cover: The top cover can be as simple as a flat sheet of plywood. We prefer the top covers made with laminated pieces to make a flat board and extra cross bracing to help hold the board flat for years. Plywood tends to warp over time. You can also use a telescoping cover, but they require an additional inner cover. Paint - All parts of your hive that are exposed to the weather should be painted with (2 coats) of a non-toxic paint. Do not paint the inside of the hive or the entrance reducer. Most hives are painted white to reflect the sun, but you can use any light colors. 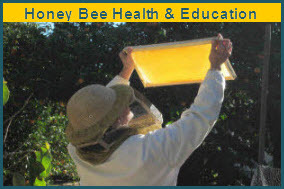 Painting your hives different colors may help reduce drift between the colonies. If your hive will not be in your own bee yard, you may want to paint your name and phone number on the side of the hive. We primarily work with the Langstroth hive but you can also use the Top Bar Hive or the Warre Hive. Bee Brush - A beekeeper needs a brush to gently move the bees from an area of observation when looking for a queen and when harvesting frames of honey. Use a brush that has long, soft, flexible, yellow bristles. Don’t use a dark, stiff brush with animal hair, or a paint brush. Duct Tape - You’ll have lots of uses for duct tape, might want to keep it handy. Hive Tool - A hive tool is the most useful piece of beekeeping equipment. It can be used to pry up the inner cover, pry apart frames, scrape and clean hive parts, scrape wax and propolis out of the hive, nail the lid shut, pull nails, and scrape bee stingers off skin. The hive tool has two parts: the wedge or blade and the handle. Hive tools are often fitted with brightly-colored, plastic-coated handles which helps the beekeeper locate the hive tool while working. Feeder - You may want to have a feeder with sugar syrup to give your new bees a boost in their new home. Its the helping hand they need to get started building comb. Smoker - Examining a hive is much easier when you use a smoker. Use it to puff smoke into the entrance before opening the hive and to blow smoke over the frames once the hive is opened. This helps the beekeeper to manage the bees. Cool smoke helps to settle the bees. Smoking the bees initiates a feeding response causing preparation to possibly leave the hive due to a fire. The smoke also masks the alarm pheromone released by the colony’s guard bees when the hive is opened and manipulated. Smoke must be used carefully. Too much can drive bees from the hive. A smoker is basically a metal can with a bellows and a spout attached to it. We prefer to use a smoker with a wire cage around it. A large smoker is best as it keeps the smoke going longer. It can be difficult to keep a smoker lit (especially for new beekeepers). Practice lighting and maintaining the smoker. Burlap, rotted wood shavings, pine needles, eucalyptus, cardboard, and cotton rags are good smoker fuels. Bee Suit - For the best protection, full bee suits are recommended. You can also use a bee jacket. But whether or not a suit is used, a beekeeper's clothing should be white or light in color (bees generally do not like dark colors and will attack dark objects). Avoid woolen and knit material. You will want to wear clothing both that will protect you and you don’t mind getting stained (bees produce waste that shows up as yellowish marks on your clothing). You’ll want to close off all potential to getting stung by wearing high top boots or tucking your pants into your socks and securing your cuffs with rubber bands or duct tape. Bee Gloves - Long, leather, ventilated gloves with elastic on the sleeves help protect the hands and arms from stings. Hat and Veil - Even the most experienced beekeepers wear a hat and veil to protect their head, face, and eyes from bee stings. Wire veils keep bees farther away from the face than those made of cloth. Black veiling is generally easier to see through. Make sure the veil extends down below and away from your neck. Once you have all you need, expenses can be kept to a minimum. With the right care, equipment, tools, and clothing will last a long time. If your hive becomes overcrowded, just add another box or two. Or, you may find you’ll want to split your hive – then you’ll have two! If honey is overflowing, just add another box or two. And, great! – You’ll have lots of yummy honey!! A note on protective clothing: There was a time when we could safely visit our bees wearing little protective clothing. 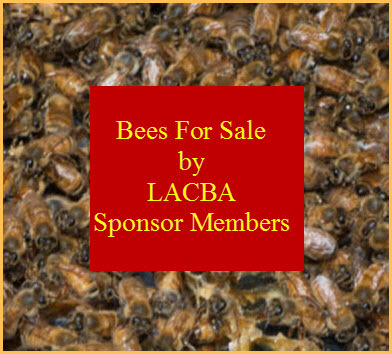 With the arrival of Africanized Honey Bees into Southern California we've come to realize the potential danger of an aggressive hive and have learned to exercise caution when approaching our bees. A once gentle hive could be invaded and taken over by a small aggressive swarm in a few days. These bees are unpredictable and vigorously defend their hives. Protective clothing such as a bee suit, veil and gloves will help keep stings to a minimum in the bee yard if worn correctly. PLANT TOUR IS AT 10AM. demonstrating how to insert a package.